Charles Green remains confident that a newco Rangers can flourish despite the impending rejection of their bid to join the Scottish Premier League. Green applied for SPL membership after acquiring Rangers' assets but six clubs have confirmed their opposition. "The consortium realised that if we went down the newco route it was a risk," Green told Sky Sports. "It doesn't alter their resolve. "Those guys invested knowing these were obstacles outside their control." Inverness, Aberdeen and St Johnstone all said on Monday that they would oppose a transfer of Rangers' share in the SPL to Green's newco, following earlier declarations from Hibernian, Hearts and Dundee United. The matter is scheduled for a formal vote on 4 July, with Green needing an 8-4 majority. "I'm obviously disappointed but we have to deal with the cards we have been dealt," added Green, who will now turn to the Scottish Football League for membership. "It's unfortunate people have come out and made these comments when my understanding was that there was going to be a vote next Wednesday, but I can't control other clubs. "I said at Murray Park on 13 May that my job will be finished when we have got financial security, when the debts are paid, when it's floated on the stock market and the fans have got the right and the opportunity to buy shares. "And nothing has changed since the 13 of May. "We really need now to get behind the club because we can see both from what's been said by the SPL and what's been happening with the players [choosing not to transfer to the newco] that really, really you need to unify and unite behind Rangers. "Let's now start moving this club forward, stop the fighting, stop the disagreements, get behind the club." Rangers were forced into administration in February over an unpaid tax bill and failure to secure a CVA [company voluntary arrangement] in order to exit the process allowed Green to purchase the club's assets in a £5.5m deal. 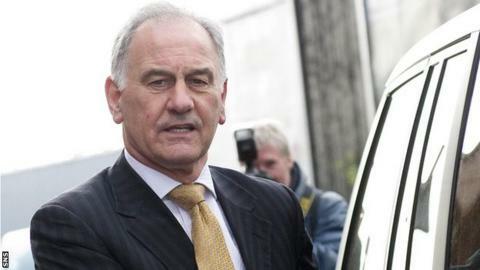 Green's group rejected a bid from a consortium led by former Rangers manager Walter Smith days after completing their deal.